Once again, please click the images if you wish to view them full size. For this photoshoot, I wanted to work in the style of Bryan Vivo, using the layout of his "Shingeki no Kyojin" shoot (featured on the artist research page.) 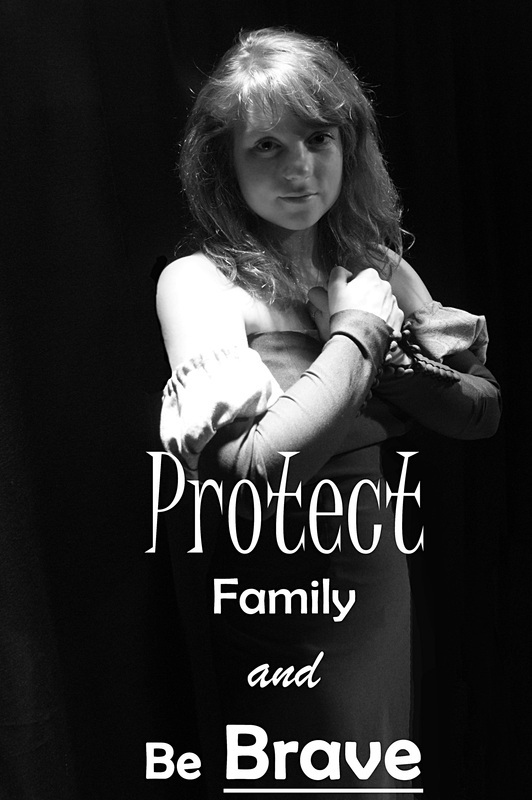 I decided to have my model cosplay "Merida" from the animated movie "Brave." 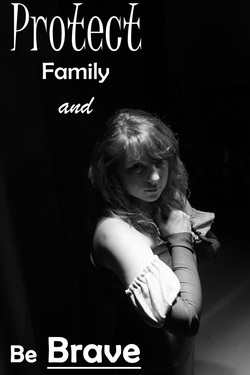 I chose this character as I felt that I could find words that would strongly represent her. This particular outfit featured in the majority of the movie, and is a key attribute to the character. Once again, I chose not to use a wig in order to make the photoshoot seem more natural. I have seen a variety of wigs for this character, but have never found one that looks good enough to use in a photoshoot. This first photograph features the model looking directly at the camera with her hands held to her chest. I used overhead lighting to illuminate the left handside of the model. Unfortunatly, I found that afterwards my photographs were underexposed and needed a lot of editing on the curves and levels. If I were to do this photoshoot again, I would prioritize having stronger lighting. This photoshoot was taken in a studio, using studio lighting, and my NikonD3100. On photoshop, I edited the curves to increase the exposure, and the levels to create a greater contrast between the light and dark areas. Finally, I changed the finished photograph into black and white before adding the text using three different fonts similar to those that Bryan Vivo used for his. The part of this photograph that I find to be the most interesting, is the strong lighting on the models shoulder. This draws the eye to the centre of the image, which highlights her physical strength that is shown in the movie. Although the character is young, she is strong; both physically and mentally. 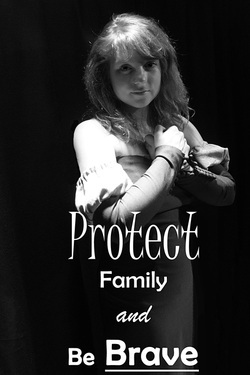 The black and white creates a bleak atmosphere to the image, as the character in the movie initially runs from her fears, however this is contrasted by the text which shows the final result of the movie, where she finds her inner strength and successfully protects her family from the antagonist in the movie. I prefer this second photograph to the first. This is because the models face has more light on it, which draws your eye to the cosplayers expression. In this photograph, the model is stood slightly off centre facing the camera directly with her hands firmly placed on her hips. Once again, the lighting is from the left handside of the model, however it illuminates much more of the subject compared to the last image. In regards to expression, the cosplayer has a strong and stern expression on her face, giving a stubborn feel to this photograph. 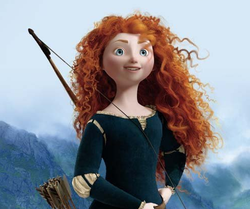 In the movie, "Merida" doesn't want to marry just anyone - and thus becomes determined to change her fate. For editing, once again I increased the levels in order to create a stronger contrast between the light and dark areas of the photograph. This is to represent the two sides to the character being cosplayed. The darkness represents the state of mind "Merida" is in when she turns to a witch for help, whereas the light represents her realisation of her mistake and need to protect her family. This is also the reason I edited the photograph into black and white. Once again, I have used the same words and font. I wanted this shoot to have one main feature in common, and that is those words that represent the character. Out of the three photographs in this shoot, this one is my personal favourite. Concerning lighting and positioning, this is the only photograph I believe that had the best composition. The first photograph was underexposed in areas, causing the eye to be drawn away from the models face. Whereas the final photograph has a angle that consequently caused me to have to change the position of the text in the image. This is the final image of the photoshoot. In this photograph, I decided to change the angel of which it was being taken. In hindsight, I wouldn't have done this as it meant the main text in the image couldn't be placed in the centre as it would cover the subject. Due to this, the photograph feels too complicated. Regarding the model, the face is once again underexposed due to the overhead lighting, and the forearms are lit up - which draws your eye to the dress in the image rather than the cosplayer. I do like the effect of having light illuminating the corner of the photograph, as it could be interpreted as a path or door to success, one which she, as the character, is about to pass through in order to resolve the movie. Once again, the model has a stern expression on her face and is directly looking at the camera. This gives a connection between the audience and the photograph, as if the character herself is looking back to assure herself that the path she is about to take is the correct one. In conclusion, I think I successfully captured Bryan Vivos style as well as incorporating my own ideas into it. With the use of text and colour mimicing his photoshoot, the idea of using expression in my photographs and the stronger contrast of light and dark areas were my own additions. Having experimented with the idea of adding text to a photograph, I have decided this isn't something I will develop further, as I personally feel that text can draw the eye away from the main subject in the photograph.